A bumper crop! After a string of years that were too hot or too cold, this spring gave us a nice long run of drippy thawing days and freezing nights. 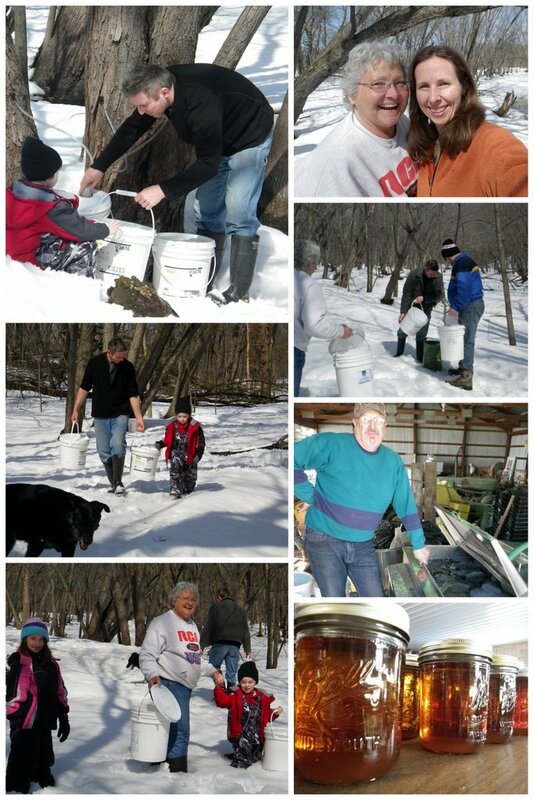 We had a couple of fun family sap collecting days! (Darwin nobly took care of most of the rest of the days by himself–thanks dad!) After collecting the sap in buckets and bringing it back up to the yard, we store it in a stock tank until the next cooking session. You can see the chunks of ice floating in the sap in the photo above. It takes about 40 gallons of sap and many hours of tending a fire under a shallow pan to make 1 gallon of syrup. The cast of characters pictured above are my parents Carol and Darwin, my brother Mark in the blue coat, Mark’s kids (aka the coolest niece and nephew in the world! ), my new husband David in black, and me (Chris) in orange. « September 24, 2012. CSA week #18. GRAND FINALE!